It's almost midnight in Sweden, and the 72-year-old jazz legend Reggie Workman is back at his hotel after the night's concert—with an 5am wake-up call in the morning. The two-week tour of Europe, he says over the long-distance line, has been a grueling one, with long drives and little sleep. The main benefit has been European audiences, who continue be support jazz in ways that American audiences do not. "They're more knowledgeable and more open to it," says the versatile, brilliant bassist. "In America, you have a situation where they can sell Doublemint gum and Toyota cars and everything, but they're not trying to sell music the same way." Workman should know. He first toured Europe as a member of John Coltrane's group. He's worked with Art Blakey, Wayne Shorter, Archie Shepp, Max Roach and countless other big names in jazz. 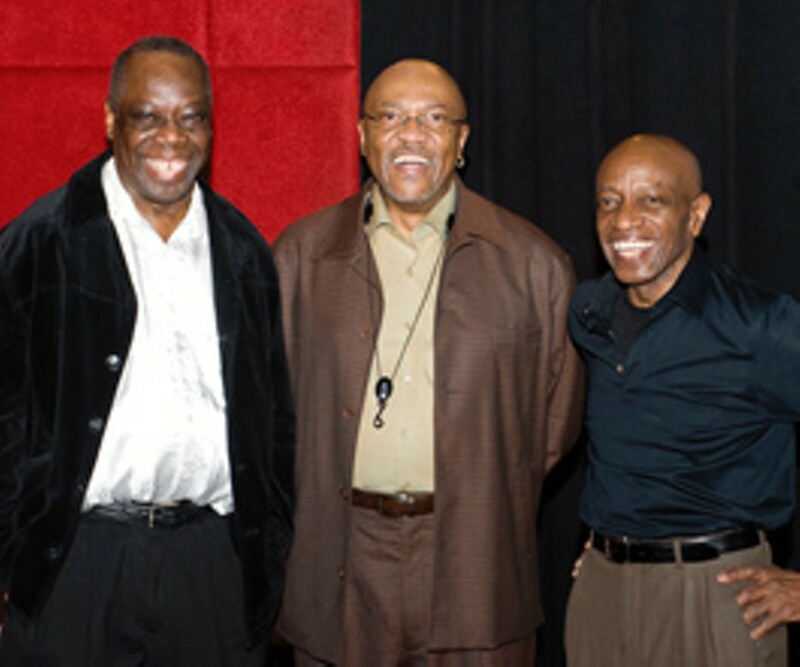 For the last 22 years, with drummer Andrew Cyrille and tenor saxophonist Oliver Lake, Workman has held down the low end for the unwavering and adventurous Trio 3, who perform Nov. 3 at two not-to-be-missed intimate shows at Flying Goat Coffee in Healdsburg. To call Trio 3 a "jazz supergroup" would be like calling Duke Ellington a "good songwriter." Cyrille is indisputably a giant of free-jazz drumming, playing for many years behind Cecil Taylor and collaborating over the years with Rahsaan Roland Kirk, Coleman Hawkins and Peter Brötzmann; Lake sprung from the 1970s New York loft scene to form and tour extensively with the World Saxophone Quartet. All three men have heavy résumés, but Trio 3—organically founded after repeatedly calling each other to fill in on club and recording dates—resides decidedly in the present, the musicians still surprising each other on the bandstand and finding those moments of synchronicity and magic so common in jazz. "We are all about moving in the same direction with the music; we've all had experience with the type of music that gives us the tools to find the matrix together, in our own way," Workman explains, "and that's an important part of the statement, because 'in our own way' means we're all going to bring something different to the fold. A lot of it is just the way telepathy goes." Workman was in his early 20s when he was asked to join Coltrane, whom he'd known and spent time with growing up in Philadelphia. "It was a hell of an experience for me to be with somebody like him, who required what he required in his band, and to have put together the kind of band that he put together," Workman says. "Not to even mention what he was doing in music, what he was doing with his ideas about formula and sound and spirit. It's not something I can just say, 'OK, this is what I learned playing with John Coltrane—boom.' It was an experience. It was a lesson." Workman can be heard at Coltrane's turning point, from Atlantic Records' Olé Coltrane to Impulse Records' Africa / Brass, and speaks of what the music required and what the music offered in the same breath. "When you get with someone who has a higher being, you know that right away. You begin to work on that particular craft, and you begin to work on that experience and gift that person is bringing to you," he says. "I was a young boy then, and I was constantly learning what to do, what the needs were. At the same time, I had something to bring to the beach besides sand, or he wouldn't have asked me to be part of his project!" Even when fresh from playing large theaters in Europe, Workman—now a professor at New York's New School for Jazz and Contemporary Music—says he doesn't necessarily mind playing smaller venues, as long as the audience connects, the feeling is right, and the evening stimulates. "The music is not embraced enough in this country so that you can have an ideal situation every time you perform," he says. "We are constantly trying to make our own situation. We bring the music to the people, that's what we're about. That's what we're out here for." Trio 3 perform two shows on Tuesday, Nov. 3, at Flying Goat Coffee. 324 Center St., Healdsburg. 7pm and 9pm. $25. Tickets at www.healdsburgjazzfestival.org or by calling 707.433.4644.